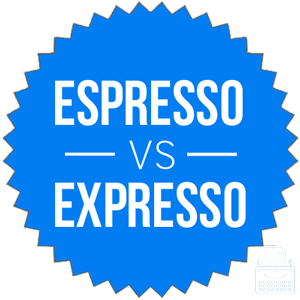 Home » Expresso or Espresso – Which Spelling is Correct? Coffee lovers have a special relationship with a certain type of concentrated, highly caffeinated coffee called espresso. Some English speakers pronounce the word with an X, like expresso. In coffee shops, more than in most businesses, keeping up appearances is important. You don’t want to come across as gauche (especially if you’re the one creating the menu). Continue reading to learn the correct way to spell this word. What is the Difference Between Expresso and Espresso? In this post, I will compare espresso vs. expresso. I will outline the correct spelling and pronunciation of this word and use it an example sentences, so you can see them both in their proper contexts. Plus, I will show you a helpful memory tool that can make choosing espresso or expresso much easier. What is espresso? Espresso is a noun. It refers to a type of coffee that is brewed with hot, pressurized water and finely ground coffee beans. Espresso has a stronger flavor than other types of brewed coffee and is generally thicker. It also has more caffeine. However, servings of espresso are much smaller than servings of other coffee drinks, negating the caffeine advantage. Here are some examples of espresso in a sentence. When I drive to work in the morning, I always see a line of cars at the drive-through espresso shack near my house. Emily brought her laptop to the coffee shop down the street, and drank an espresso while she studied for her test. Espresso is an Italian invention, with the first machines developed in Italy around the dawn of the 21st century. Over the next 100 years, coffee drinkers all over the world began to love the powerful drink, too. What is expresso? Expresso is a spelling variant of espresso. The French spell the word this way, but in America, it originated as a misspelling. It is such a common mistake in spoken English that many speakers don’t recognize it as nonstandard. Indeed, some dictionaries even list it as an alternative spelling. While espresso is closer to the original Italian, expresso still closely approximates its meaning. The word express can refer to speed, but it can also refer to individual service (like the phrase expressly for you). Both of these meanings are carried over from the Italian term. Many English users (especially the kind who become editors) still view expresso is a misspelling, though. Unless you have a good reason to use expresso, you should avoid it. The chart below shows the relative usage of express vs. espresso in English since 1800. As you can see, there is really no contest in written English. Espresso predominates by an order of magnitude, so there is really no reason to ever expresso. If you are writing for an English audience, you should use espresso. Expresso is still not universally recognized as an alternative spelling, although its acceptance may grow in the coming years. Remember that espresso has an extra S, like the word sip. The proper way to drink espresso is to sip it, preferably with an air of elitist pretension. By linking espresso with sip in your mind, you will always know how to spell both of these words. Is it expresso or espresso? Espresso is a noun that refers to a certain type of coffee. Expresso is a common misspelling based on a mispronunciation of this word. If you are writing in English, you should, only ever use espresso. 1 What is the Difference Between Expresso and Espresso?